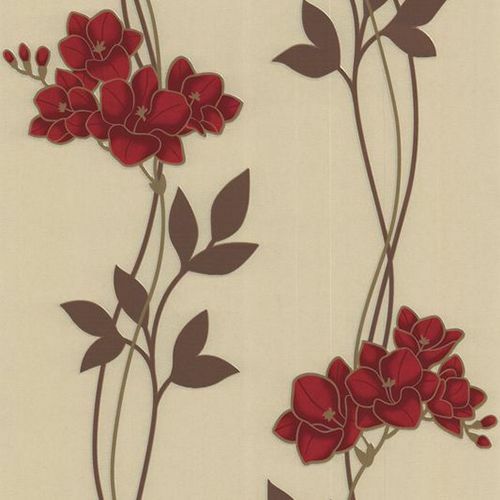 An oriental orchid, elegant and simple in red and cream hues. Experience the sophistication and personality wallpaper adds to your décor without the hassle. This wallpaper makes decorating quick and easy just paste the wall and hang the paper and remove it in full strips when you're ready for a change. Details: Paste the wall application for quick and easy installation. Easy to hang and removes in full strips. Textured wallpaper covers minor wall imperfections and paneling. Each roll is 11 yds. X 20.5 in. And covers 56 sq. Ft. Washable with a damp cloth and soapy water.